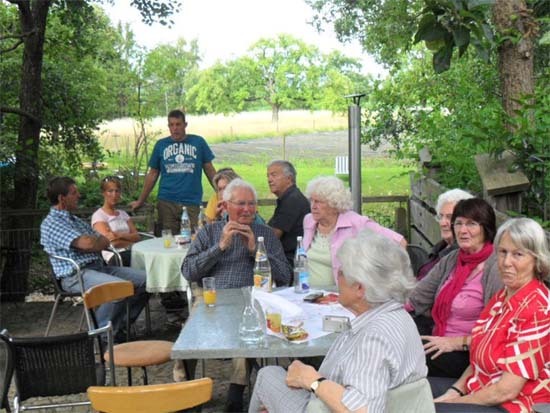 On July 6, 2011 Walter Fuss, one of the stalwarts of the men’s choir, celebrated his 80th Birthday in his house, which lies between Kappel and Kirchzarten. Since he’d invited the chor, we went at 5pm, greeted each other with handskakes and handed him our present and his wife Magdalena a bouquet of flowers. 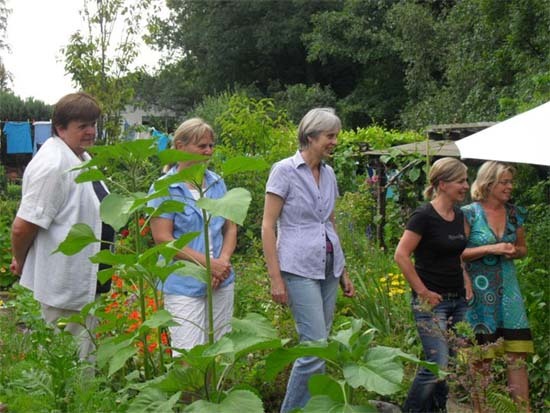 It was idyllic in the garden which was behind the house. The sun was shining, the tables were prepared for the guests and Walter was waiting with his family and relatives. Walter had given us a list of his favourite songs during our rehearsals for the Geistliche Konzert, and we didn’t disappoint him. The first song was Abendfrieden composed by Hildegard Eckhardt. The song was about Bergheimat (mountain home), which evokes a feeling of peace in the hilly surroundings of the Black Forest. The second song was Bild dir nichts ein composed by A. Gunthet and dealt with life: you’re only a human being, whether rich or poor, big or small, at the start or at the end, we’re all together the same. A thought-provoking song. The next one was Am Brunnen vor dem Tore (Der Lindenbaum) composed by Friedrich Silcher, about a fountain near the gate where you’d find your peace. The last song was My Schwarzwald, My Homeland composed by Joseph Blum and was about: where God’s wind blows and birds are at peace, crowned by the dark pine trees, is the home of my parents. How often did I want to leave the Heimat earth. O Schwarzwald you highland light, O land of blue mountains built in the sky. After we’d feasted with Schwarzwälder schinken, sausages, self-made farmer’s bread and baguette and drunk beer or red and white wine, three male singers from Walter’s family packed out their musical instruments: two guitars and an accordion, and what followed was a Heimat evening with German, English songs sung together. A jolly musical family, I must say and it was lovely to hear all the ladies yodling to Alpine songs. That was family-togetherness whereby music and songs seemed to bind the family. Later in the night we sang Beatles and Elvis Presley songs and, of course, other songs of the sixties. In my mind I was transported suddenly to Cat Steven’s Katmandu with the zeitgeist of those days: make love, not war, hippies smoking charas, peace signs everywhere, Europeans wandering in the streets of Katmandu in pairs at peace and tranquillity with the world. It was almost midnight when we bade Walter and his dear wife Magdelena farewell and returned home to roost, humming the tunes we’d sung in the course of the wonderful evening. 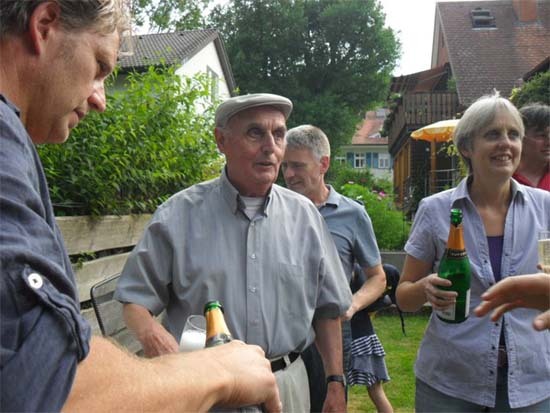 Uli, Walter Fuß and his daughter at his 80th birthday 2011. Magdelena with her musical family members at their residence. 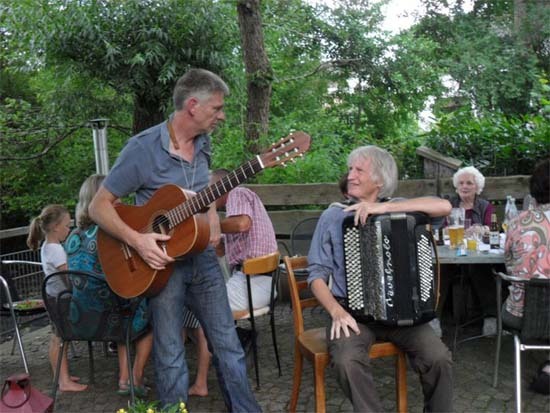 The Fuss-singers are well-known in the Dreisam Valley and beyond for their Heimat songs, German Schlager and international songs.